UVI brings Synth Anthology 2, an extensive collection featuring 77 modern and classic hardware synthesizers, adapted for the free UVI Workstation or the Falcon hybrid monster. As mentioned above, a total of 77 hardware synthesizers were sampled by UVI sound designers, using high-end gear from Manley, Langevin, Lexicon, Publison, Focusrite, SPL and more. The second volume comes with 25 new synths, including Oberheim OB6, Dave Smith Prophet 6, Korg Minilogue, Novation Ultranova, Ensoniq ESQ-M, Akai AX80, Alesis Fusion, Korg Triton, Roland Juno 60, Roland Juno 106, ARP Quadra, Moog Source, Roland JX8P, Yamaha CS20m and more. 52 synths are same from the first volume, but that doesn’t mean the sound patches are the same. 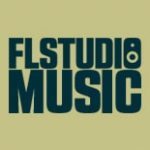 There are 500 brand new presets, showcasing in a sleek, intelligent and modern way all the aspects, sound types and characteristics of the sampled hardware instruments. The specifications are impressive: 2,518 presets from 20,395 samples – that’s 8.22GB of data (FLAC lossless encoding, was 15.7GB in WAV). The sample resolution is 44.1 kHz, but the recording was made at 88.2 kHz. But maybe the most impressive is the clean and easy-to-use interface which requires a minimum learning curve and offers enough controls to get your own sound. The user interface has 6 pages (side tabs): OSC, EDIT, STEP, LFO, FX and ARP, each offering in-depth tweaks and tons of sound customization. In the OSC page, you find the picture of the sampled synthesizer among volume and panning controls. You can activate the sub oscillator, choose from different waveforms and adjust volume and panning. Underneath, there are two sub-pages, Main and Sub, that give you access to the ADSR and filter sections for the main sample, respectively sub oscillator. Next is EDIT, which again, is divided into Main and Sub, the modules being the same type for both sub pages. We have a mono/poly switch in the Pitch section, as well as the Octave and Semi selectors plus the Depth and Time. The Stereo module adds color and width to the sound, while on the Modwheel part below, you can select which effects to be triggered by the modwheel, of course. There are four effects to choose from: Vibrato, Tremolo, Filter and Drive. Let’s move to the third page which is a powerful step modulator with adjustable steps. Also, you can select the speed and delay and set the rise and smooth effects. The step modulator is for different parameters such as volume, filter cutoff & resonance and drive, applicable for main sample and sub oscillator, separately. The fourth page allows you to sync the LFO to the host tempo and adjust LFO speed, as well as choose the waveform type. 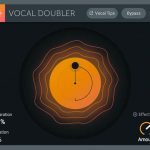 Map it to pan, volume, pitch and filter sections, to add movement to the sound. The LFO modulation can be set for both main and sub oscillators. 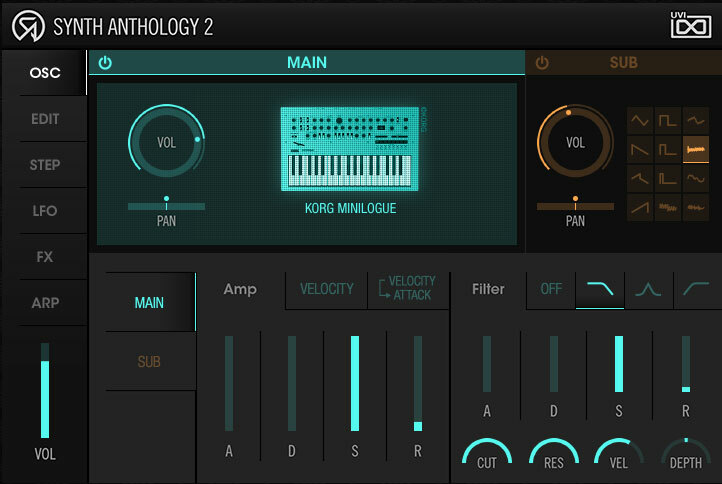 Synth Anthology 2 comes with a suite of powerful effect processors. You have at your disposal a cool bit crusher, the fantastic Sparkverb reverb, the Thorus new chorus, a modern delay, phaser, and a simple drive. The last page is ARP, which lets you arpeggiate the sound of the two instances, as we’ve already accustomed: the main oscillator and the sub oscillator. For each channel you can set the steps, speed, octaves range, gate, as well as choose the direction – up, down and up/down. The sound of Synth Anthology 2 is clear and flawless. I have never had the opportunity to play one of the synthesizers that stay at the base of this virtual instrument, but I can say that the sound is superb and varied, full of character – true. Once you get into the presets vortex, hours will have passed without notice. Another beautiful aspect is the GUI. 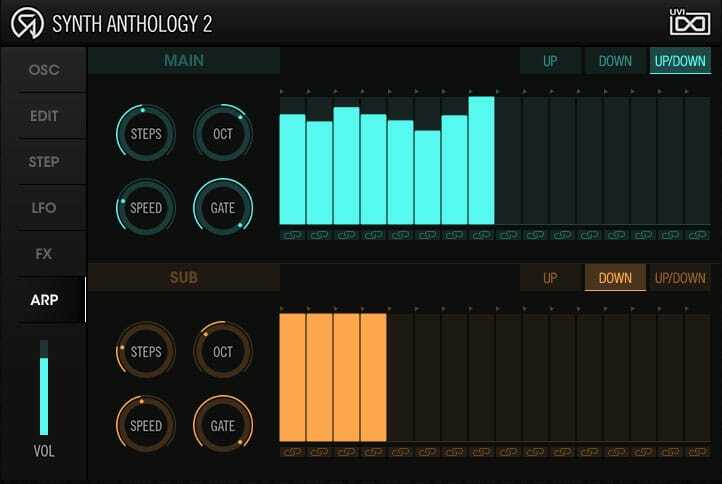 Synth Anthology 2 comes with a clean and modern interface, easy to use and very intuitive. And by intuitive, I mean amazingly intuitive. The sound “tracks” are smartly color coded, the on/off action is stripped down to basics. 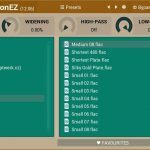 The GUI isn’t scalable, but its fonts, knobs, buttons, patterns and all the rest are perfect in size, clearly legible, you don’t need to push your head in front of the monitor to select or tweak a parameter. You can navigate through the tabs and access all the plugin aspects, which means more time to concentrate on the actual music making. Synth Anthology 2 has the best GUI I have ever seen; everything is refined to a smart simplicity. 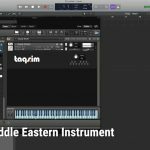 For example, to assign a plugin parameter to a MIDI controller knob, simply right-click on the parameter you need/want to control, click “MIDI Learn”, then move the MIDI knob, and you’re good to go. I love you, UVI! Instead of giving me a pompous virtual replica of vintage gear, you gave me something that aligns to current times. Finally, we have a synth which is modern in every sense of the word. 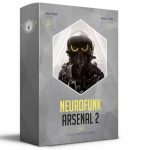 Synth Anthology 2 costs €149. I can’t say if it’s more or less, but I can say, for what it offers, it’s worth all the money. 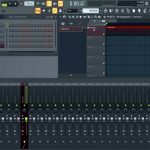 Synth Anthology 2 can be loaded in the freeware UVI’s Workstation or Falcon soft synth, being available in AU, AAX, VST and standalone formats for Windows and Mac.